Consumer sentiment is taking a hit from Brexit. 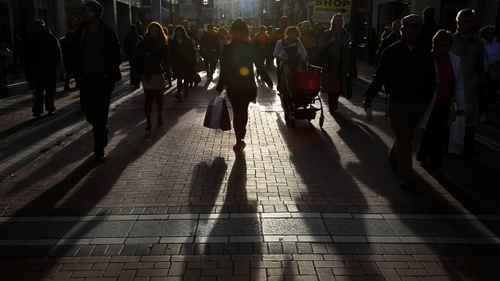 According to Bank of Ireland's latest economic pulse, there has been a substantial hit to sentiment in recent months as consumers start focus on the potential economic impact of a no-deal Brexit. "The pulse got off to a muted start in the new year," Loretta O'Sullivan, group chief economist with Bank of Ireland said. "Consumers are particularly gloomy. Households downgraded their assessment for the economy. It's really around Brexit and the ramped up talk of no deal and what that might mean for the economy." The composite sentiment number for consumers and business is roughly at the same level but their paths towards that position have been quite different. "In the first half of 2018, sentiment picked up for business and it was at a high level for consumers. In the second half of the year, that reversed course against the backdrop of heightened concerns around the global outlook, trade tensions and, of course, Brexit. "Business has been living with Brexit for longer and you can that in the numbers. Businesses have been processing the implications for longer. The consumer is only beginning to take on board the implications now," Dr O'Sullivan explained. There is an apparent contradiction in the business outlook given that they may be facing the most severe economic shock in many years in the event of a no deal Brexit, yet just under half of businesses expected they'll be awarding pay increases to staff this year. "We're at an interesting point. On the one side, we've Brexit and all the uncertainty that brings and on the other side, the economy is moving towards full capacity. You can see that in the unemployment rate. "45% of workers say they think it's easy to find or to change jobs. Firms are looking to give pay increases in order to retain staff and staff are expecting pay hikes. Loretta O'Sullivan said the economy would need to see an uptick in immigration to relieve some of the pressures on the system. Figures from recruitment website irishjobs.ie point to an increase of over a third in UK based job applicants looking to Ireland for posts in the past year.